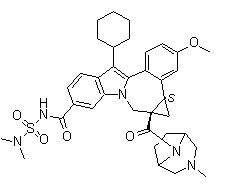 Pibrentasvir, also known as ABT-530, is a protease inhibitor potentially for the treatment of HCV infection. 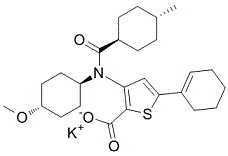 GS-566500 is a Sofosbuvir metabolite. Sofosbuvir impurity K, an diastereoisomer of sofosbuvir, is the impurity of sofosbuvir. Sofosbuvir impurity G, an diastereoisomer of sofosbuvir, is the impurity of sofosbuvir. VCH-916 is a novel allosteric inhibitor of HCV NS5B polymerase. Anguizole is a small molecule inhibitor of HCV replication and alters NS4B's subcellular distribution.